Visitors from as far afield as North Yorkshire, and New Zealand turned-out to visit the beautiful sights of Cupar Flower Show last weekend. The one-day extravaganza, held in the Corn Exchange, Cupar on Saturday 22nd August, saw a very colourful and attractive display for those attending. This was the first time that the Show had been run on one day only, mainly due to the ever-increasing costs to hire the venue. Colourful displays in cut flowers also provided wonderful scents of sweet peas, dahlias, begonias and herbaceous plants, despite the abysmal weather we’ve experienced this summer. This was a true testament to the determination of the growers. There was also a fantastic backdrop on the stage from the Caledonian Bonsai Society, who were busy styling trees throughout the day. Bill Duff from Balmullo was the winner of the East of Scotland Four Vase Sweet Pea Championship. The floral art category saw an increase in the number of exhibits in each class. This year’s judge had a tough job of selecting the winners as the quality of the exhibits being very high indeed. The best floral exhibit in show, sponsored by Gladys Lundie, Cupar, was awarded to Mr Andy Smith of Balmullo for his exhibit incorporating a picture frame. There was a fantastic display in the vegetable section, with the extraordinary specimens of the tallest leeks, carrots and parsnips being shown by Mr E Low of Strathkinness, who also gained the most prizes in the vegetable section. The industrial section was supported well with a range of home baking, preserves and handicraft section. Mrs Vera Drysdale who excels in this section taking a number of trophies, also took home the Watt Trophy for the exhibitor with the most first prizes in show. This year’s School Competition required pupils to create a tree model from recycled materials, with the trophy went to Kilmaron School. The Scottish Women’s Rural Inter Institute Competition based on a picnic theme was won by Craigrothie SWRI. Franek Janeckzo, the judge for the garden competitions was very impressed by the work and dedication that the exhibitors put into their gardens given that it is not an easy task when the weather is not being so kind. It is hoped that people who enjoy taking care of their garden, whether it be a vegetable and/or floral gardens, that they’ll consider entering next year. Any garden is eligible to enter – along with allotments and even plant containers. The generosity of the local businesses through sponsorship or the donation of prizes cannot be emphasised enough; it’s down to them that we are able to award the level of prizes we do and to put on such a fantastic show. Gladys Lundie, past member of the Society, presented all the awards at the close of the Show. Vice President, Debbie Wheelans thanked all the competitors, committee members and visitors who made the show a success and said “It was nice to see some of our new, and younger, exhibitors coming away with many of the awards and trophies. This was the first year we have tried a one-day show and we’d be grateful for your feedback. 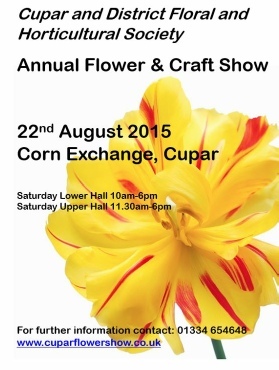 We hope the community will keep supporting the flower show for many years to come”. The Annual General Meeting will be held on Tuesday 27th October in the YMCA, Cupar at 7pm. Everyone is welcome to attend to help us plan future events and keep the longevity of the Society going. The hamper was won by Mrs Margaret Harris of Glenrothes. Guess the weight of the cake, sponsored by Fisher & Donaldson was won by Jean Gray of Cupar. Many thanks to all who donated prizes and raffles. Photos from inside the show. Photos from the garden competitions.